When screen first comes up, Location information will be red. It will remain red until the GPS Sensor in your phone receives GPS (Global Positioning System) data. This could take up to a minute. When it receives information, the location information will turn lime-green. Wait a bit more to see if the information turns darker green. That indicates the accuracy has improved to below 10m. 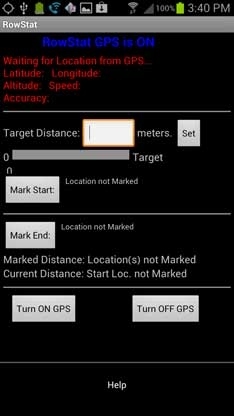 Enter a Target Distance if you want an alarm when your distance from the Start Location is greater than the Target Distance.As you move, the distance from Enter a Target Distance if you want an alarm when your distance from the Start Location is greater than the Target Distance. As you move, the distance from the Start Location will be displayed on the progress bar. Press Mark Start to set the start location. Press Mark End to see the distance from the Start location. Your distance from the Start Location is displayed next to “Current Distance”, and when you press Mark End the distance between the Start and End location is displayed next to “Marked Distance”. Your distance from the Start Location is displayed next to “Current Distance”, and when you press Mark End the distance between the Start and End location is displayed next to “Marked Distance”. A speed is also provided in the GPS location data. This can be used to measure a shell’s speed, from a powered coach boat running on a parallel course, at the same speed. GPS status turns "lime" green when phone is acquiring GPS location. GPS status turns "dark" green when phone is has acquired GPS location, below 10 meters.